The Race2Recovery team say they are going through their final checks before setting off on the Dakar Rally in a few hours time. Captain Tony Harris said: "Having been part of Race2Recovery right from the beginning and having put in so much work, along with the rest of the team, it feels surreal to finally be in Lima and be hours away from revving up on the start line." The Race2Recovery team is trying to complete the Dakar Rally to raise funds for Help for Heros. The charity is raising funds for the Tedworth House recovery and rehabilitation centre in Wiltshire. You can download a fundraising pack which will help you arrange your own events to support the team. The two US Marines involved with the race are also raising funds for the Heros Project which supports injured service men and women in America. 28 people make up the Race2Recovery team competing in the Dakar Rally. But the team has four rally cars competing in the event with a driver and co-driver in each vehicle. Captain Tony Harris was blown up by an IED in Afghanistan and his leg was amputated below the knee. He is joined by Cathy Derousseaux an experienced rally co-driver. Ben Gott, a rally specialist is paired with Marine Staff Sergeant Mark Zambon. In 2011 he stepped on an IED and lost both his legs. Justin Birchall is a civilian rally driver who has competed in British and European rally events. Corporal Tom Neathway is a triple amputee who recently carried the Olympic torch through his home town. He was injured after triggering a booby trap in Afghanistan in 2008. Major Matt O'Hare is a founding member of Race2Recovery and is partnered with Corporal Philip Gillespie. Gillespie's right leg was amputated below the knee and his left leg was significantly damaged after he stood on an IED in 2011. Olympic and Paralympic star Oscar Pistorius sent a video message to the Race2Recovery team praising them for putting the focus on ability rather than disability. A team of injured soldiers are making the final preparations before they attempt to become the first disabled team to complete the Dakar Rally. 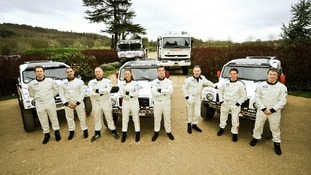 The Race2Recovery team includes six British soldiers who lost limbs or suffered serious injury in Iraq or Afghanistan. The 28 strong team will drive some 5,600 miles across three countries as they try to raise funds for Help for Heroes.